Welcome friends to fall in our dining room. Fall arrives in subtle ways here in Texas. We don't have big changes in the leaf color that some of you experience but the sunsets we have are stunning! Pink and blue are splashed across the sky with amazing glory! I love this time of year. Do you? If you've visited our house before, you know that the dining area is right inside the front door. Our living/kitchen/dining/entry area is wide open so all the decor flows together. This vignette was inspired by a really sweet lady I met recently through Craig's List. Now, don't go thinking anything crazy - I was buying something from her that I will share soon. J. and I hit it off as soon as we met and she brought me right into her house for a full tour. Woohoo! You know, I never miss a chance to see how others live. J. had her dining table arranged with candles, cloches, rustic wood cutting boards, and lots of cake plates. I was awed by the beautiful combination of items and realized that I could do something similar using items I already own. Thinking about the vignette that J. had created sent me digging through cabinets to find pretty things I hadn't used in a while. I do love the way this all came together. The colors are soft and fitting with our home yet the nod to fall is definitely there. I like it that way. 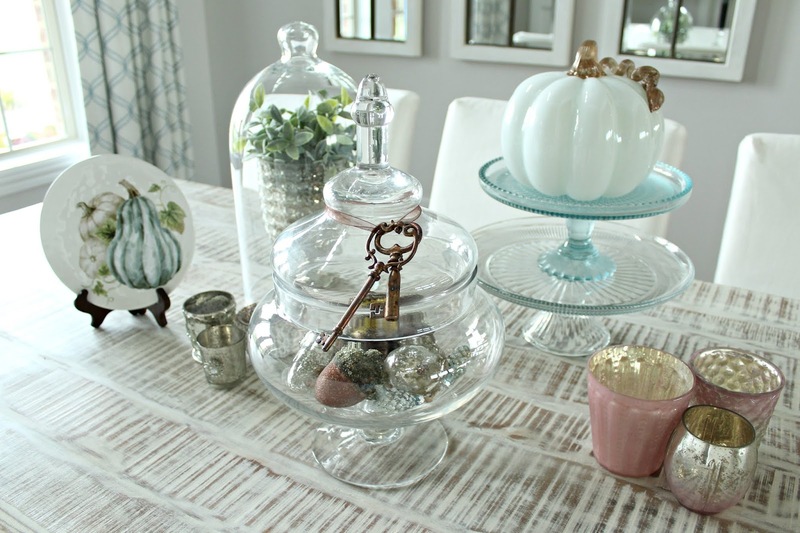 Glass cloches, apothecary jars, mercury glass candle holders, cake plates, and wood. What a beautiful combination! The white pumpkin was a HomeGoods find last year. She looks pretty happy there on top of her throne. There was a time when I wanted all the orange pumpkins but these days I want our fall decor to match our current aesthetic. Splashing pink and blue around for fall works out beautifully- in the sky and in our home. You don't have to go shopping. Just look in your own cabinets. Look around for inspiration. New friends and old friends can teach you. You already have things you love. Use them! Don't worry about the expected colors of a season. Express your own look with joy! By the way, I have received a few emails telling me the font is too small on Poofing the Pillows. Today it's larger. What do you think? Stacey... love your decorations! What a refreshing change from orange and black. Have a wonderful week! 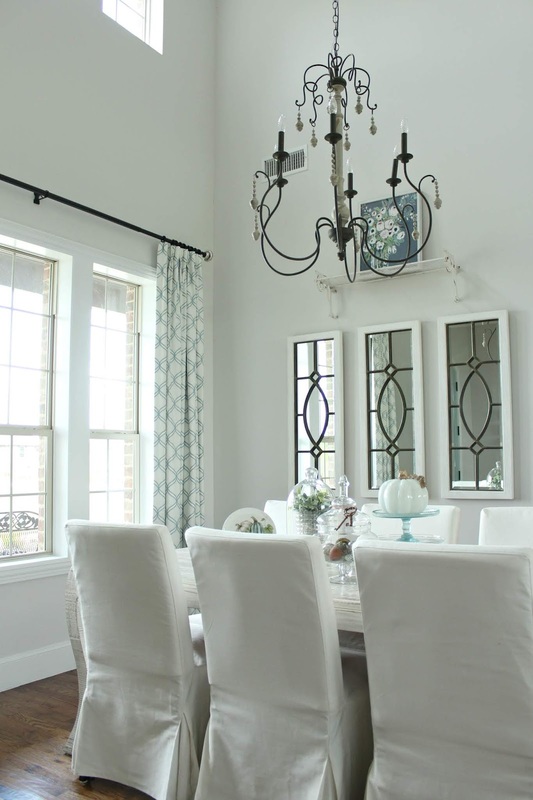 Beautiful vignette in your lovely dining room! I love the soft colors you have in your decor for Fall. The blues, whites, pink and silver all go together so nicely. Your dining table vignette is so pretty. Happy New Week. You never know what amazing things might happen, right?? Now you have a new buddy and precious vignette! How pretty and soft it all looks! Lol, I appreciate the larger font! Your table looks fabulous. How fun to find a new friend and get to see inside her house! I like to see others' homes too! Oh that looks so pretty Stacey! I got the pumpkin pitcher like that from Pier 1. Oh how I adore your neutral decor. So calming and inviting. Wish we could house hop, sit at your table for lunch, then my porch for dessert! LOVE your style! I love fall too. It's so nice when it actually starts to cool off a bit. Love how you decorated the table! Very pretty. The glass pumpkin is stunning. It’s fun to shop our own homes. Love your beautiful cake plates in your fall tablescape, and your chairs are gorgeous! Always exciting to find a new friend and get a recharge with our decorating, it looks wonderful and i agree completely, i get tired of the same old thing. I love your beautiful table centerpiece and even more that it is not orange and gold and yellow. It goes perfectly in your room and does give the feeling of Fall. I love getting ideas or actually copying someone else's great idea and then having all that I need right at home to recreate it. I thought I'd try to go more neutral this year and bought a real white pumpkin. Then today I couldn't resist a HUGE real orange pumpkin for $5 (they can get crazy pricey around here) for my front porch. It will be an eclectic Fall decorating theme for me this year! Ya know... 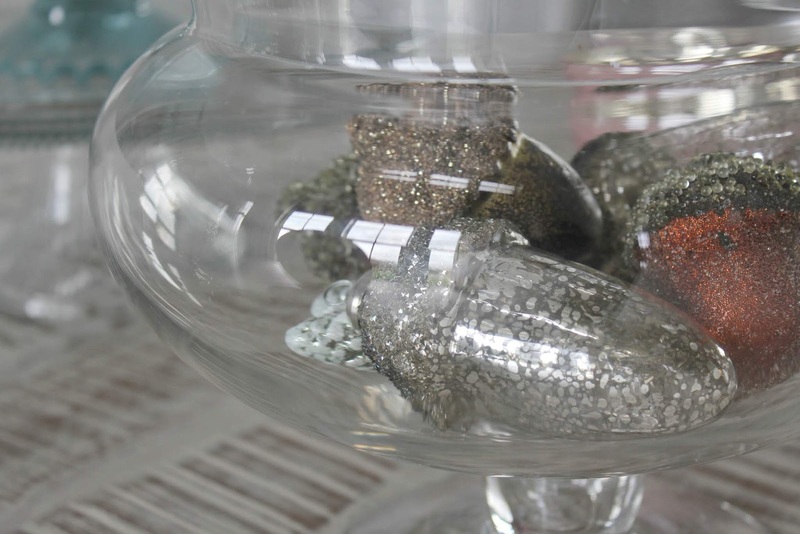 I really would like a couple mercury glass acorns... just saying! Pinning! So pretty Stacey. I love the way the light bounces off all the glass. 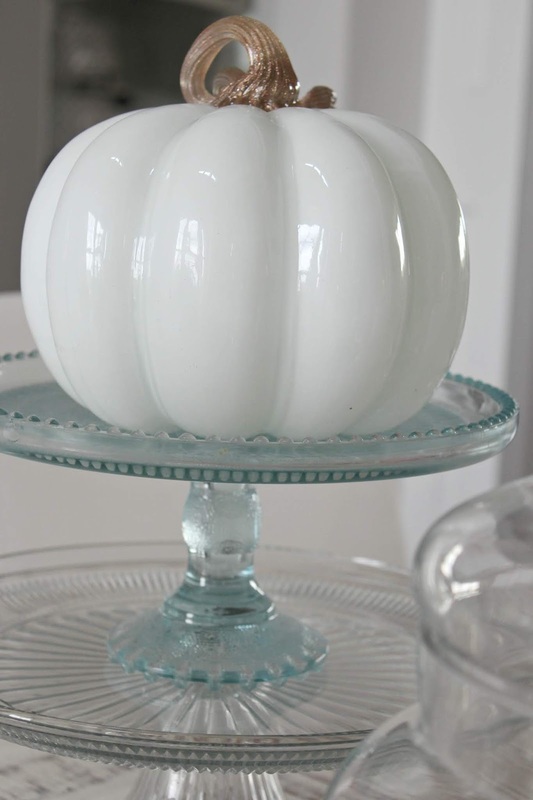 Such a beautiful glass pumpkin!Looks lovely on your pretty table. It's all just beautiful Stacey! I love how we get inspiration from others. The subtle colors are just perfect in your gorgeous home! Stacey, I just love your style. Fall at its best. I'm loving the softer colors this year and your table is beautiful! 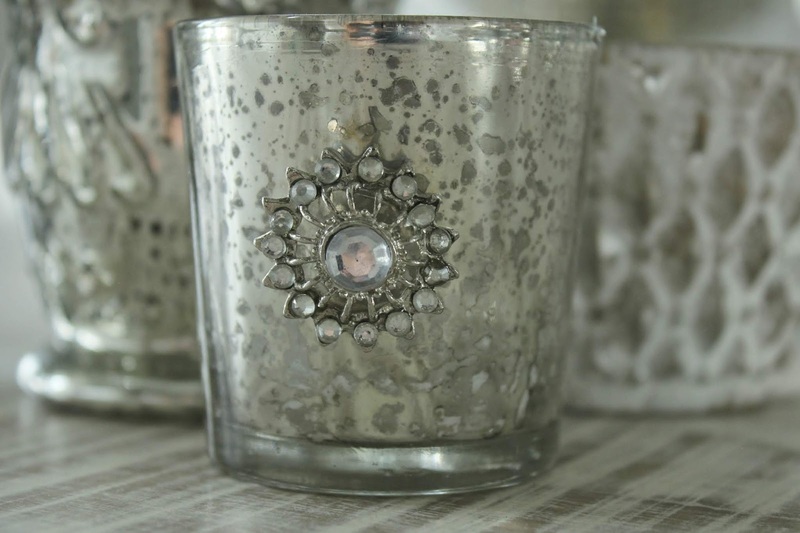 Isn't it fun to "find" treasures in your home? Love this fresh cool look, a great spin on traditional colors for Fall! I am especially drawn to the white pumpkin. Very elegant, yet not stuffy, you nailed it, gorgeous! Oh Stacey, what a perfect table arrangement! It speaks to fall but with light and air and pure loveliness! Your cool colors are so pretty! I love the mercury glass and the blue cake plate. 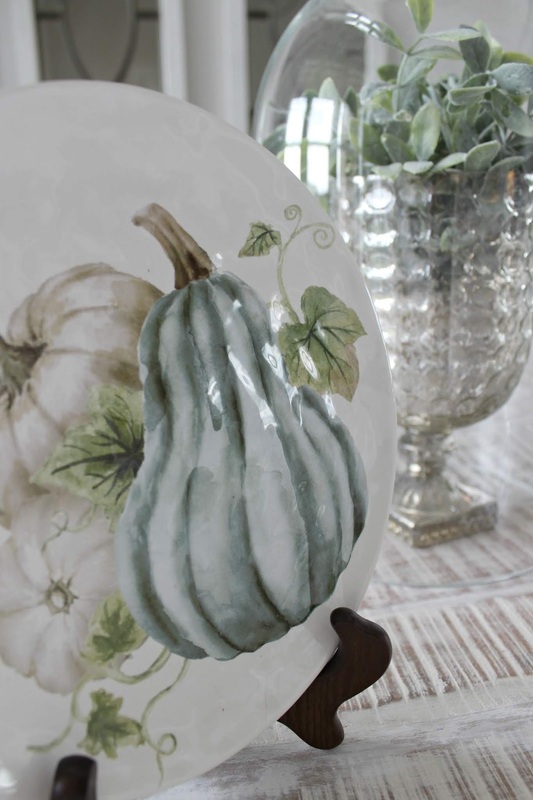 And the pumpkin plate is darling! Fall in Texas is different from Idaho, for sure. What impressed me with your Fall decorating, are the subtle and soft colors! They are so beautiful, that I “taste” them. Nice way to bring in Fall. Wow Stacey, that looks so beautiful. I love the soft colors and the white, silver, pink, and acqua color scheme. You have such a beautiful dining room! 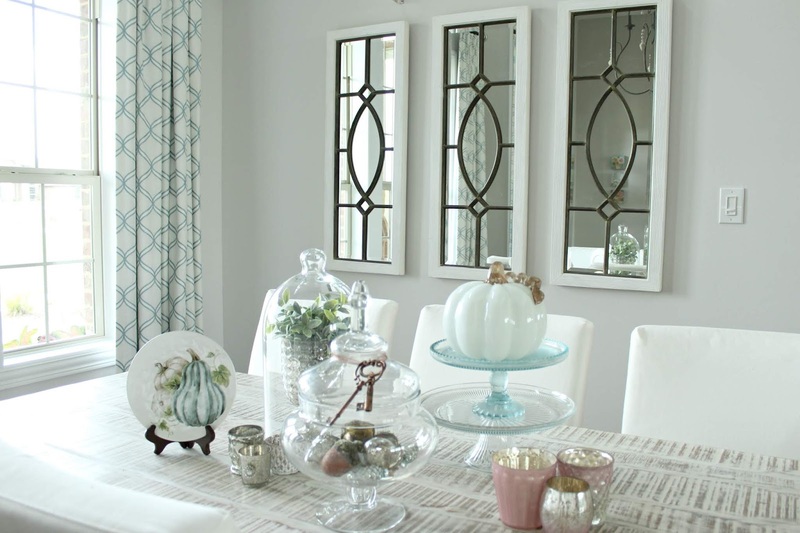 I absolutely love the soft colors in your dining room, Stacey. Your pumpkins and votives in your vignette are so pretty! I agree that you should decorate to enhance your decor. Stacey I think this idea with the glass pieces is so pretty and certainly something I would not think of as fall. But you pulled it together beautifully! Now I'm tempted to look through my cabinets too. Love it Stacey! Especially that mercury glass! Stacey, I just love this mix with the neutral and soft colors. It's always fun to shop your own home. I absolutely adore that chandelier!! All your fall decor is so pretty!!! It's so pretty! How fun to meet a kindred spirit and find inspiration! Thanks for sharing at TFT my friend!